The result of a four-year partnership between Amorim and O-I and a joint R&D investment of around five million euros, the development of Helix drew on both companies’ innovation capabilities and expertise in serving global wine markets, gained from a heritage that stretches back over a century. The new ‘twist to open’ concept combines an ergonomically-designed stopper made from proven micro-conglomeratecork and a glass bottle with an internal thread finish in the neck, creating a high performing and sophisticated wine packaging solution. Helix combines all the benefits of cork and glass – quality, sustainability and premium image with user-friendly, re-sealable convenience. It can be quickly and easily implemented by wineries with only a minor (10 minute) height and orientation adjustment to existing filling lines. 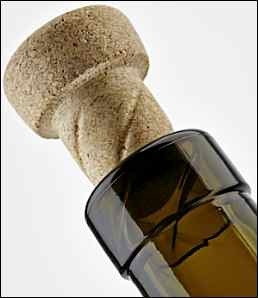 The threads inside the neck of the glass bottle interact with the cork's natural elasticity to create matching grooves. The grooves are already in the pre-shaped cork but not visible until after insertion in the bottle. It is surprisingly easy to twist out of the bottle and reseal yet it forms a perfect leak-free seal of a regular cork closure (tried and tested by thedrinksreport.com). Helix tests included intensive extraction and re-insertion, long term storage (26 month trial) and accelerated ageing (30 days at 35 degs C horizontal strorage).